We often get several questions about splitting our humbuckers in wiring circuits. It’s a very easy upgrade to get some more tones out of your setup. It works great in an HSS configuration, or even just to add splitting to any humbucker equipped guitar with only a few quick changes. For this tutorial, we’ll be assuming we only want to use one pot to make one humbucker split. You can use multiple push pull pots for additional splits or more wiring options, but more on that at another time. Coil Splitting is often referred to as “coil tapping” Technically, coil tapping is accessing a coil within a coil, but with splitting we’re really actually splitting two coils wired together in series, the slug and screw coils of a humbucker. Your favorite humbucker with 4-conductor hookup wire. Single conductor/metal braided won’t work! Decide where you want to put the coil split. Maybe you want it on the volume, or the tone knob? Think about the location and how it might work best for your playing. Remember, when you pull the knob it will cut the humbucker in half. You can place the split with the push-pull pot anywhere that works for you. Make notes of your current wiring to the pot you will replace. Make sure all ground wires, capacitors, hot leads, etc will be able to go back to where they were! Take a few pictures with your before unhooking anything. Remember that adding the push pull will mean less of the back of the new pot to work with when placing your ground wires. you can ground to the side or top of the push-pull casing. install your new push pull pot in place of the old one and hook up the lower sections as they were, and to the appropriate lugs. 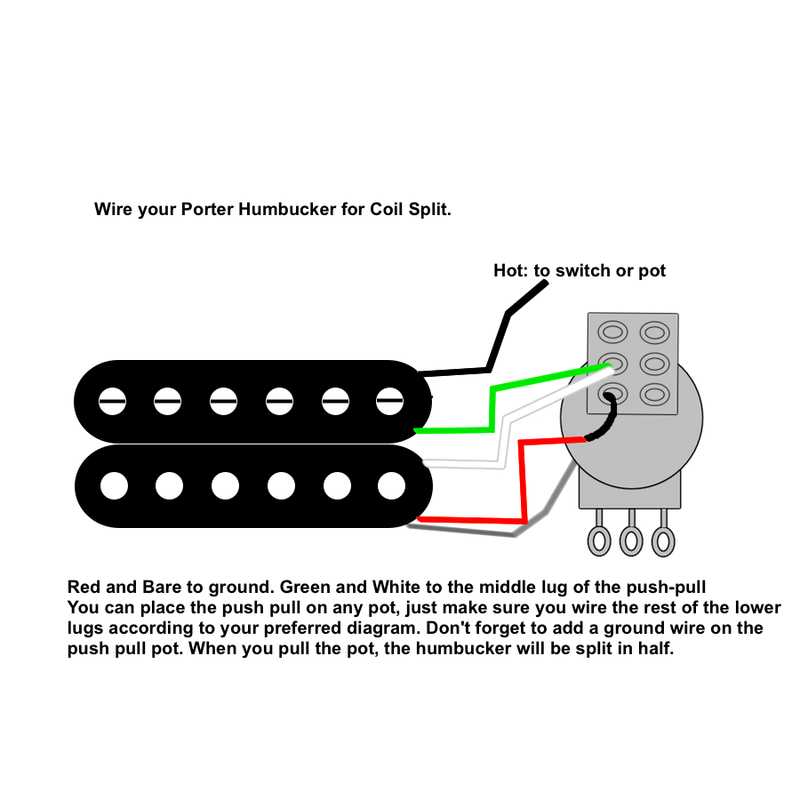 To install your coil split, solder the appropriate wire colors from your humbucker (Usually the end of each coil) to the middle of the left side of the row of 6 lugs on the push pull pot when looking directly at it. Make sure to add a ground wire from the lug right below your coil split connection running to the back of the pot. Hook up your humbuckers hot and ground leads where they were before. (You may have already done this or didn’t even need to touch them if they were installed to a separate switch. If you’d like to test your wiring job, take a screw driver and see which half of the humbucker stays active when you pull the knob. Gently tap on the pickups on both sides of the coil. See which one goes silent and which one stays active. Enjoy your new and more versatile axe! Brian’s Blog: Give it a Go!